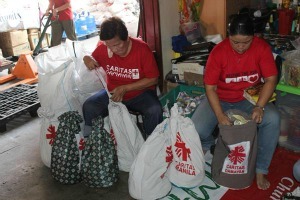 Caritas volunteers in Manila preparing aid packages. Caritas has launched an emergency appeal for €264,000 (US$300,000) which will fund the provision of food, temporary shelters, sleeping bags and hygiene materials for people flooded out by the slow-moving storm. Almost 300,000 people have been affected by the storm which made landfall in Aurora Province on 17 October. Authorities have now shifted focus from search and rescue to recovery and relief operations, as floods in affected areas started to subside. The emergency programme will initially cover 16 affected dioceses in Central and Southern Luzon, Cagayan Valley, Cordillera Administrative Region, Ilocos and Calabarzon. High winds and heavy, persistent rains led to severe flooding, landslides, damaged homes, fallen trees and blocked roads. Many people were evacuated into over 200 evacuation centres, but food is short. Diocesan help centres have been overwhelmed with requests for assistance. Caritas teams will continue on the ground assessments to ensure needs are met and the most in need people are reached. Typhoon Koppu (locally known as Lando) comes almost two years after the devastating Typhoon Haiyan (local name Yolanda). Haiyan was one of the most powerful typhoons on record and killed over 6000 people. Since then Caritas has rolled out programmes to help communities to become more resilient in the face of the increasing number of powerful climate events hitting the country.